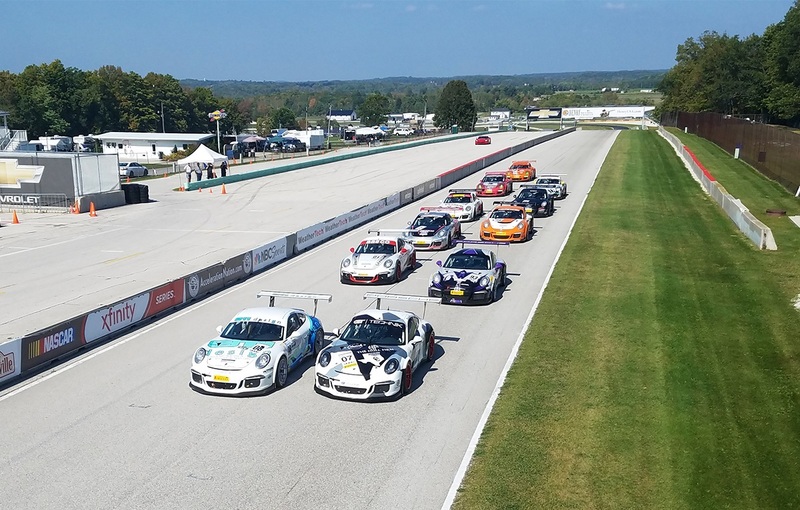 Elkhart Lake, Wis. – 911 Design’s Loren Beggs took the overall victory from pole today in a wild Round 14 of the Pirelli GT3 Cup Trophy USA at historic Road America to increase his championship lead in the Diamond category. A significant portion of the race drama took place behind Beggs, as battles throughout the Diamond Masters, Platinum and Silver Masters classes saw side-by-side action for the entire 18-lap, caution-free event. With temperatures again approaching 90 degrees, Beggs started his No. 08 911 Design Porsche 991 GT3 Cup Car from pole in the Diamond Class (for Porsche 911 997.1 versions) and immediately dealt with college freshman Max Root (No. 07 GT Technik Porsche) filling his rear-view mirror. But when Root suffered a mechanical issue on Lap 10, Beggs only needed to navigate slower traffic around Road America’s 4.048-mile road course to take the victory, with Aasco Motorsports’ Alex Kirby second and Root third. 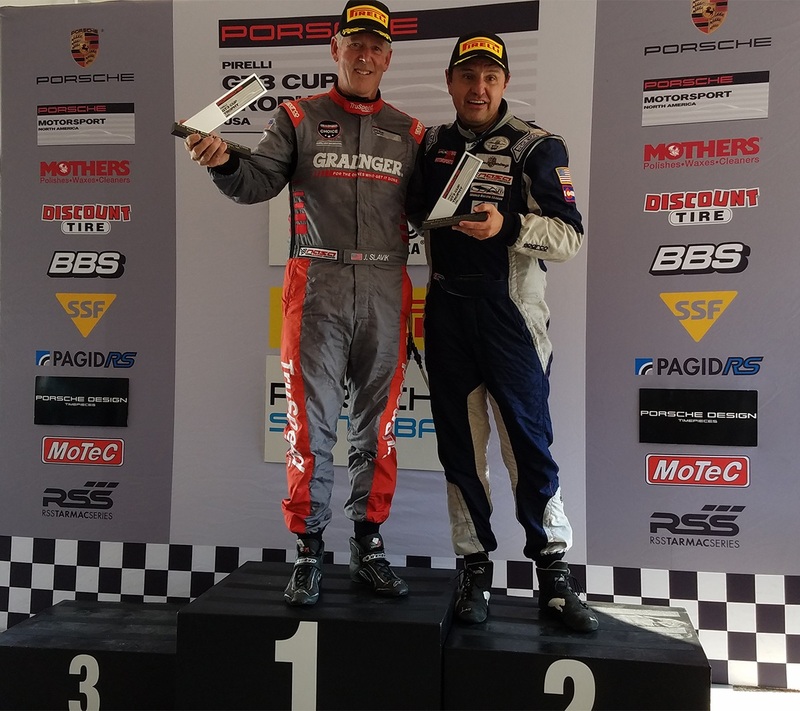 In the Diamond Masters class, Beggs’ 911 Design teammate Dave Elsner started his No. 33 Porsche 911 GT3 Cup on pole and pulled away from his competitors, finishing first in class (for his first series win) and third overall. 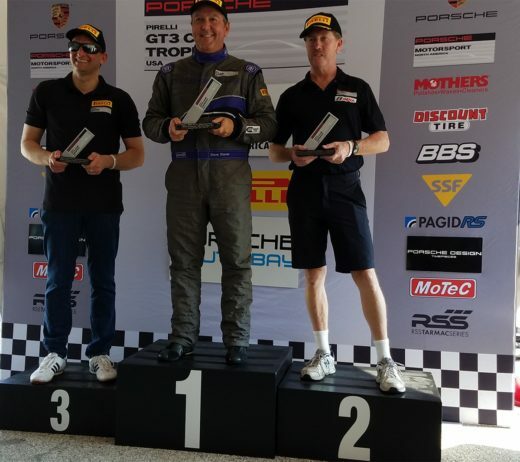 But behind Elsner, four cars fought for the final two podium spots, with Mike McAlister (Competition Motorsports), teammate Michael Zuieback, Will Lin (TruSpeed Autosport) and his teammate Tom Haacker continuously swapping positions. McAlister hung on during a late-race high-speed off coming out of Canada Corner to finish second, with Zuieback third. In the Platinum Class (for Porsche 911 GT3 Cup 997.2 versions), Jim Slavik (No. 89 Grainger TruSpeed Autosport) and Robert Gardner (Basin Fluids PCS Motorsports) contested a nose-to-tail battle for most of the race. Slavik started on pole but missed the apex in Canada Corner on Lap 3 and Gardner was able to get by, only to miss a shift and allow Slavik past coming out of the Carousel on Lap 13. 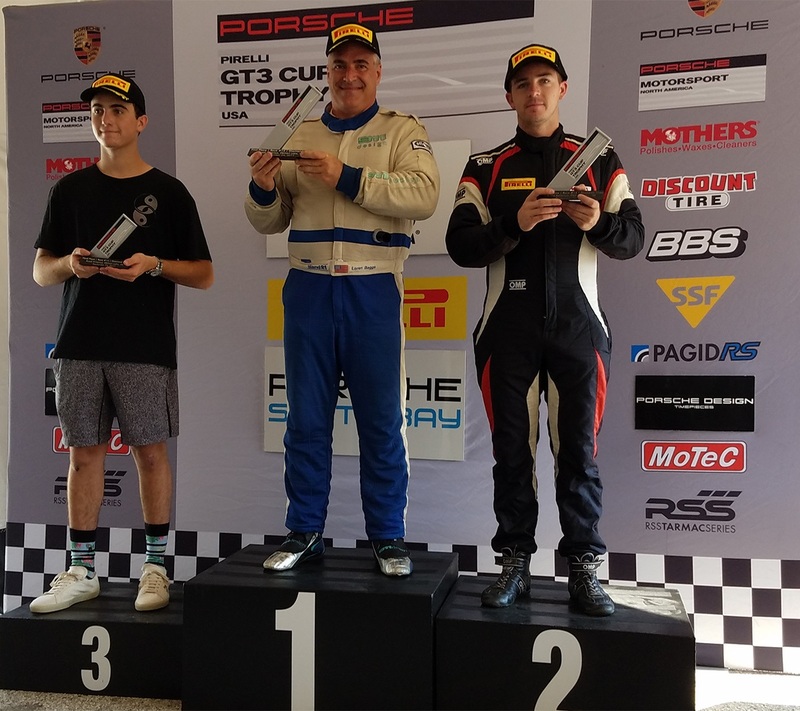 Gardner got another run in Turn 1 as the pair went through the turn side-by-side, only to overshoot in Turn 14 on the final lap ­­­­to give Slavik his first victory of the season. 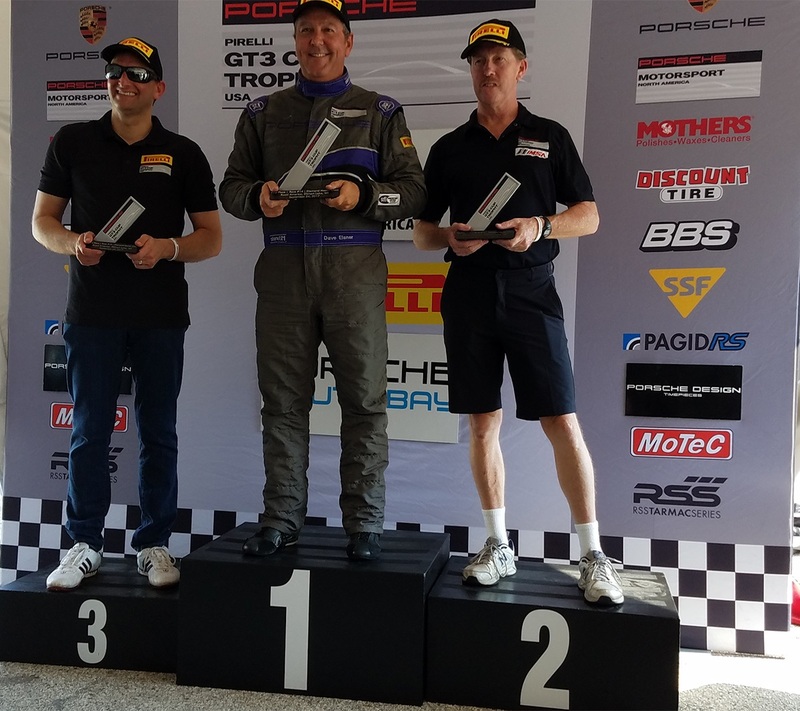 The Silver class for Porsche Cayman GT4 Cup Cars was again won uncontested by Jeff Kearl in the No. 26 Rearden Racing Porsche. 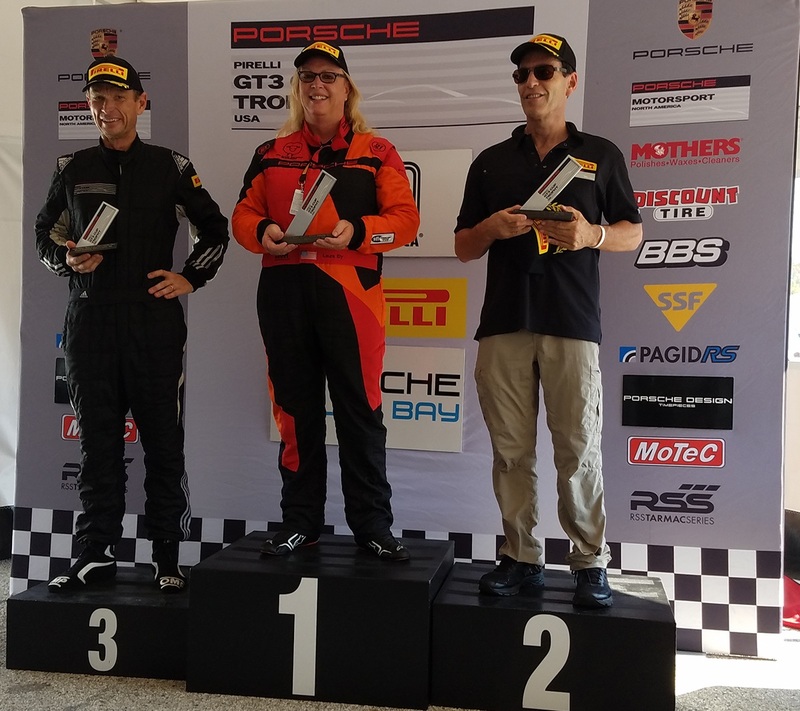 In the Silver Masters class, Steve Goldman and Competition Motorsports teammate Laura Ely engaged in a spirited fight for the pole in morning qualifying, with Goldman taking the top spot by the slimmest of margins. Ely, in only her fourth race in the series, knew she would have few chances to get around the veteran racer and took her best opportunity early, making the pass on Lap 3. Goldman stayed right on Ely’s bumper for much of the race but could not get any closer for a second-place finish, with Flying Lizard Martin Brauns third. Competent Motorsport President Greg Franz appreciated the chance to showcase the series at such a legendary road course. 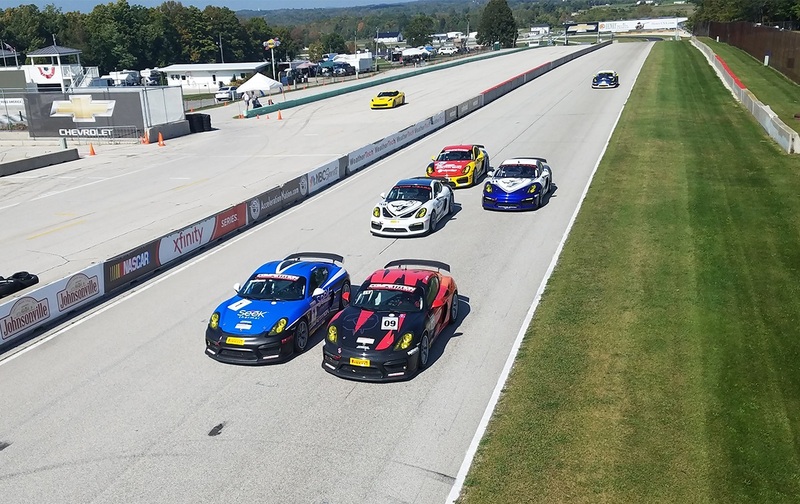 The Pirelli GT3 Cup Trophy USA heads to Mazda Raceway Laguna Seca for the two-race season finale on October 12 – 14.